Spring looks to retire a bit. Yes, spriing looks to retire a little bit, the next days we will have to live with lower temperatures(well, in fact the "normal"ones for the time of year), will be a day or two more cloudy, even some rain is expected. I think we will survive it, but we aren;t used to it anymore LOL. But Monday it still was rather nice so I did go to town centre. Only was unlucky that I just missed the tram as I stept out of the door. Not really a disaster, cause they come about every 12 minutes. But it took a long time before the next one came. I had to wait for around half an hour or even more. Seemed to be some malfunctionof a kind, but it still was a shame it took so long. Anyway, I got into town, first went to the Chinese shop, bought some noodle soups and also a pack of quick-cooking noodles, that I used that evening. 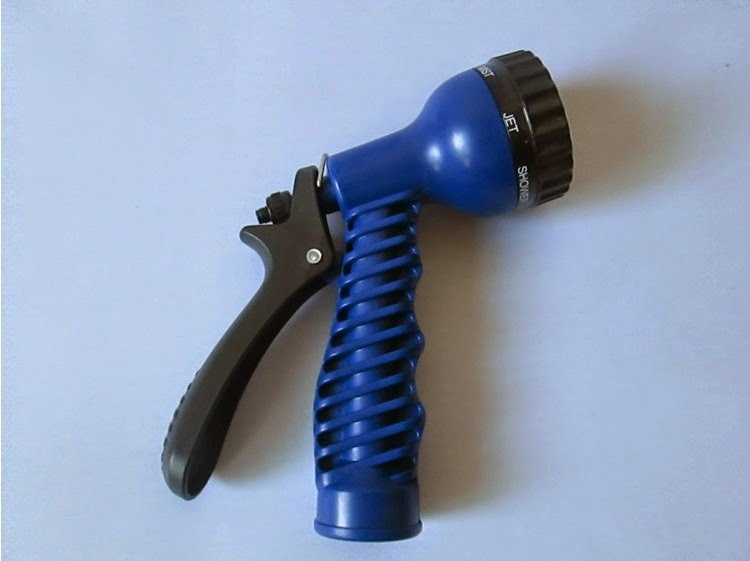 I also went to a kind of 1 dollar shop and found a new device for our waterhose in the garden. The sprinkler at the end was broken, we still could use the hose, but not the way we liked. Didn;t stay all too long in the centre, and the tram was on time this time LOL. Yesterday I had to deliver a bill at the bank(you always have to pay something, and those aweful bills always arrive on Friday;s or Saturday mornings, just to spoil for a moment your weekend ROFL). Spent a bit of time in that shopping street, came home with a couple of little things and just had to shut my eyes for a short time, so took a nap. Oh, coming home I saw a little mess in our bedroom, caused by Jan, fixing the wallpaper that was coming down a bit from the wall after the leak. It looks already better, but we still will have to paint the wall for a part, and no, not all too much reaction from our neighbour, which I find very unpolite. Oh well, just lets hope we will have no more leaks because of him. Some good news is that our central heating kettle is still working great, we don;t loose water and pressure anymore after that nice plumber came for the repair. I am ever so greatful to him LOL! All things in the garden are growing still, part of the seedlings Jan has to repot already( specially the sunflower seeds I bought for him, a package with four different specious in them from a height of 40 cm, to 60 cm, to 2 mtr and even one should become 2,5 mtr !!). If all seedlings will grow well we even might have diffulty to find a spot for all of them, hahaha. But I always can give a few to Heidi, which would be nice too. 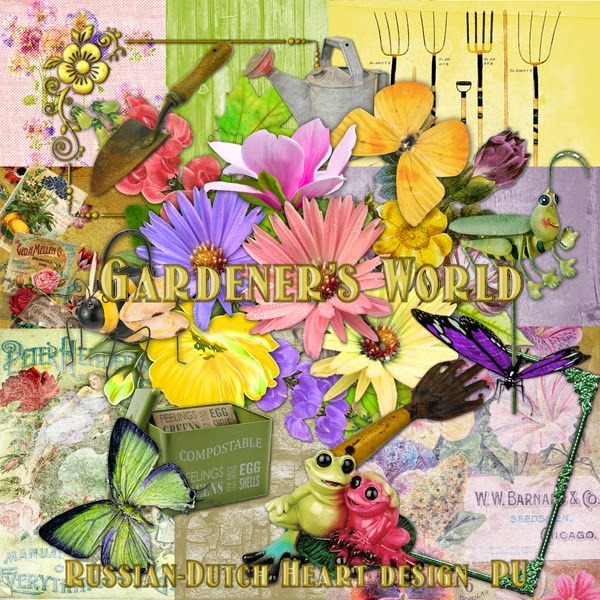 Today I have a kit for you, named "Gardener's World". 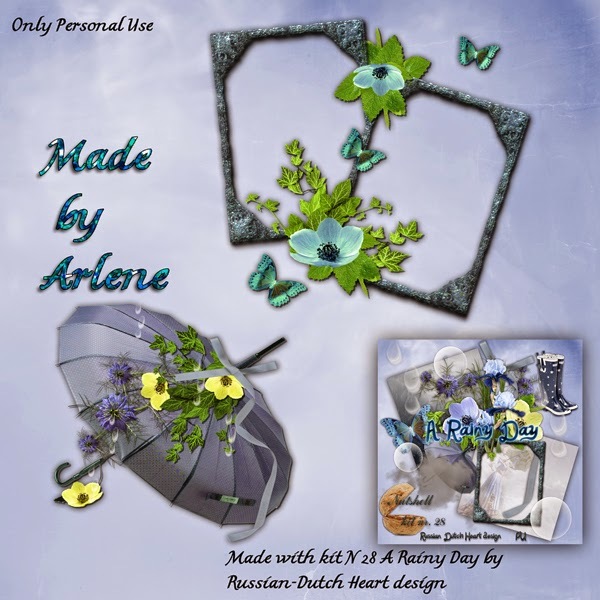 Arlene made again some lovely clusters and a quickpage from it, but I will post them Friday. I really have to split a bit the freebies, because of the low rate of designing production I have at the moment. 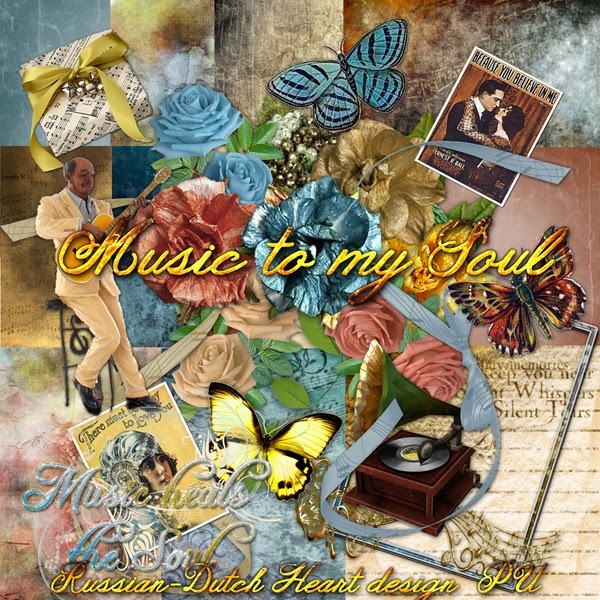 Before leaning you I want to give you the link to Linda;s blog, because she made an awesome quickpage with my kit Music to my Soul. 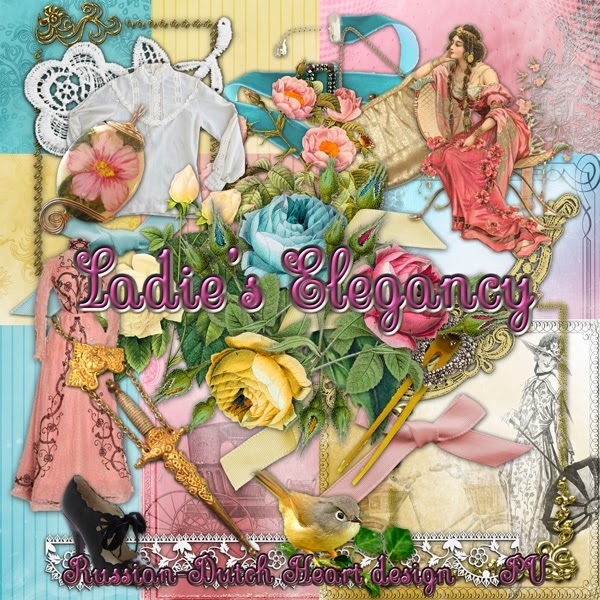 And you should visit the blog of Miriam, she just posted a HUGE wedding kit there, but also usuable for lots of other layouts, it;s a beautiful kit with lots of papers and all kind of elements. Don;t forget to leave a little thank you if you download! Have a great day and till Friday! Our King's Day passed in a great way. Our first "King's Day" was blessed with a wonderful weather! Saturday morning I first watched a bit the tv, of course about the visit of the Royal Family to two towns in Holland. I have two links for you, where you can see and read about this day and look at some photo's of the Royal Family during their visit. Then we left around 12.30 to see some fleemarkets, it already was great to be outside. Arrived at the long and big street (one of many) where there was a fleemarket, it was rathr crowded, but still possible to look and walk around. There was no hurry, so we looked left and right and halfway we even took something to drink. arrived at the end of the lane, it was just a short while to walk on and arriving at Scheveningen at the beach. It was the first time this year I saw the sea again, and it was a good feeling. But after a short walk on the boulevard we diceded to take the tram and go home. Our legs began a bit to protest, and I must say I was glad being home again at around 16.00 a.m. I didn;t make a lot of photos during our walk(not much fun in taking pictures of a crowd) but I have a few I made on the way. I always love to see the canals with the boats, and on a sunny day like this one, it looks even better. Oassing a little parc I saw this group of statues, but most special about it was the nest of moorhens, and they had already youngsters, so sweet!! Here we are at the beach, I just loved the clouds in the sky there, and I even managed to take Jan on the photo(which is always hard, because when he hotices I make a picture of him, he tries to turn his head or dive away LOL). It still was sunny and wam enough at that time, but slowly more clouds drifted over, and we even had a bit of rain in the evening. 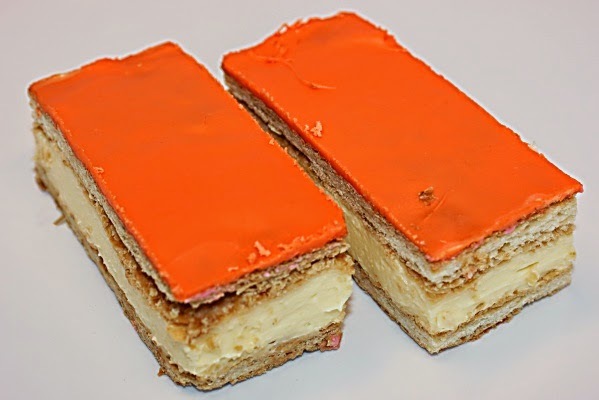 We spent the evening on the couch, watching tv, but with our coffee we had a little extra because of King's day, a "oranje tompouce", and it tasted good! Sunday I was a busy bee! I still had some red cabbage, and green beans, also some stew pears, I had to prepare for the freezer( well, the 1st two, the pears were for dessert after dinner), also had a laundry in the washing machine turning, and it took some time to have it all ready in freezer bags, cooling of. But now the veggie drawer in the freezer is filled well again. That done I thought I deserved a bit of computer time, and so I did do some designing and then it already was time for dinner. All together we had a good weekend. 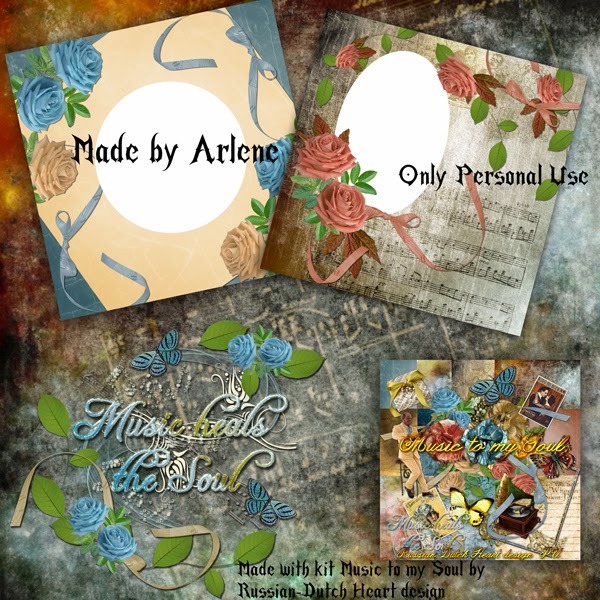 As promised I post today the clusters Arlene made with the last kit, Music to my Soul. Not susch a big freebie, but the producing rate is still a bit low, somehow I seem to need more time for a kit these days. Don;t know yet what I will do today, but I need to chenge the bedsheets again, and now that the washing machine is empty, it seems to be a good time for it. Perhaps, if I feel up to it, I will take a quick visit to town centre, there are some little things I need to buy, so may be today is the day for it. You all have a fantastic start of the week and see you again on Wednesday! How could I forget THE DADDIES!! Totally forgot to tell you about the final of Everybody dance now of last week! We did see a couple of really good acts, but the most entertaining one was from the Daddies, oh yes, it gave us a fantastic chuckle!! And believe it or not, they actually won the final!! It's a great bunch of men, having normal jobs during the week, like carpenter, salesman, and such, and they worked real hard to make another lovely performance! They are all between roughly 30 and 64 years old! Last time they mentioned they had to loose a bit of weight and so they did. All together they managed to loose 64 kgs. I have a link of their facebook page for you, where you also can see the video of the final, if you just scroll a little bit down. Put in on full screen and of course with your speakers on, it will bring a smile on your face! Last couple of day the weather behaved rather well, so on Wednesday Jan and I went to the market and we came home with a filled trolly. But... even if we took a look at "our"plant stand there, I managed NOT to by anything LOL. Yesterday I did the "normal"shopping bit, and so today I really will have to do something in the house. I have taken a few pictures of our garden, still rather empty, specially for the flowers, but it's not yet the time they all have to blook. All has speeded up because we had such a mild winter, so now we expect that all will bloom earlier too, but for a lot of things it doesn;t work that way, it seems. and at the back those wonderful pansies to already have some color around. Overview of part from the terras to the back. Can you our wonderful azalea alreay full in bloom in that fantastic pink ? All between the green plants, that are a bit the body of the borders, we have planted seeds and bulbs, all doing their best to grow now, so exciting to see it happen, cannot wait to see (hopefully all of them)in full bloom. Here a closeup of the chair with one of the buddha's, with a pot of nasturtium, that just kept on blooming during winter too, but now is giving lots more of new flowers. And here our cat Brodski, in full glory, when he accompanied me during the photo session LOL. Just had to make a close up, they are sometimes hard to make, but this one sia good one. Tomorrow I think we will have a busy day, with the King's day. I have printed out a list of all the faires and fleemarkets and I think Jan already has a walking route in his head. Pfffff, I think we will be exhausted at the end of the day, but who cares, as long as we have fun and the weather is coorporating a bit. I already upload my little camera, to take it with me. Tomorrow morning I will sit for a little while in front of the tv, to watch the Royal Family on their visit of a couple of towns, I am always curious to see how the ladies are dressed! Kit for today is named "Music to my Soul". I am just posting the kit today, and will post the cluster and 2 quickpages arlene made(they are lovely!) on Monday.as I have trouble with the "production of kits at the moment ( don;t seem to have lots of time either these days), I am splitting that up. But perhaps I can finish a kit I am working on this weekend, although that will have to wait till Sunday, cause tomorrow I will not spent much time home and at the computer. Have a wonderful weekend, you all and till Monday! Long time no posting LOL! It was a good thing I already warned you I might not post on Monday, as I didn;t! What happened in our Easter weekend. Well, for first weather wasn;t too bad, there were moments with sunshine and then temperature was already nice. Also some clouds came over and even we had some rain, but all together not to complain too much about it. Let me first start with the not so nice surprise we had as starter for the weekend.I think it was on Friday evening, when I changed clothes into a comfy jogging trouwers and fleece sweatshirt, in the bedroom and as I just loooked around I noticed a strange spot on the wall near the bed. Cheking it out it felt all WET! Oh no, please don;t tell me we had another leak !!!!!!! But it was, and from the neighbours upstairs. So I told Jan, he came looking, and wasn;t too pleased either. As it was a bit late already, he would go to them next day. Okay, it wasn;t yet dripping so it could wait a bit. But then when I wanted to go to bed and opened the duvet, I saw a strange spot on the matras, I touched it and oh my, it was moist! So that was not nice at all! We spent the night on the couches, and we didn;t catch a lot of sleep. Next day Jan went upstairs to tell about the leak. Seems the guy already noticed it( they seemed to have a coat of water on the floor), so he had closed the water distribution tap, and promised he would fix the problem the weekend. Funny, he had trouble with the water and didn;t come to ask if we had any trouble!! Well, we heard he was busy all weekend and I think it is fixed now. But he didn;t bother to come down for a moment to see what damage has been made and to ask if all was okay for us now. Perhpas he will come today, but I have no high hopes for it. But anyway, Saturday we we able to sleep again in our bed, hoorray. Today Jan will go upstairs and summon the guy to our appartment to have a look, because it isn;t looking nice, for one part of the wall paper is getting of the wall! I told Jan that this time the guy will have to come and fix our wall and of course the costs for it are for him. If he doesn;t want to do it(for him it is just a couple of hours work, he he young), I want to have a lot of money from him in advance so that we can hire somebody to make it look nice again. Okay, that was the not so nice part of the weekend. All the rest we did spent a god Easter. We didn;t go for an egg hunt in the garden, LOL, but for the evening I had a tasty meal, and I made a little tray with stuffed eggs( you know, the ones you boil the egges, cut them i halves, take out the yellow, you mix that with a bit of mustard, salt, pepper, paprika, dille and lots of mayonaise and put that mix in the white halves). And we had some little chocolate eggs too. Rest of the day and next day too, we just spent our time a bit in the garden, a bit knitting(just me), Jan made his swedish crosswords, watching a bit of tv, perhaps not too exciting, but ever so nice. I also did some designing, still production rate is rather low, but nice to see still something is coming out of my hands LOL. Next few days, the weather should be very nice, with great temperatures, so we should take advantage of that. And on Saturday we will have our "Koningsdag" (Kings Day) as we had our Queens day for many years.Now our King will have his first one. On that day he will visit one or two towns, and we will see that on tv all day. But there are also a lot of activities going on that day in our town, lots and lots of faires and flee markets, so we will be busy visiting some of them. And there also will be the "geranium-market"as it is called. It's in town centre and there will be lots of stands from flower and plants growers, with lots of beautiful things and oh so dangerous!!! Aboput every year we say we will not buy any plants, but always come home with something, hahahaha. Okay, that in short was our weekend, and Easter is over, and we really are heading a bit towards, perhaps, a nice summer????? Most of our seeds are growing, as also the bulbs, oh my, if all will flower later we should have lots of color in the garden! Time to finish the post now, time is running and I do have to accomlish something today, apart from sitting at the computer ROFL. So let's go to the freebie. 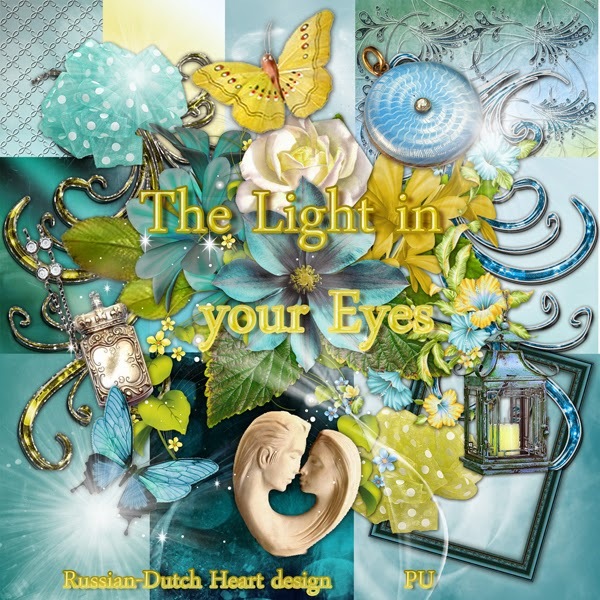 It's named "The Light in your eyes", in mostly blue color with a touch of yellow. 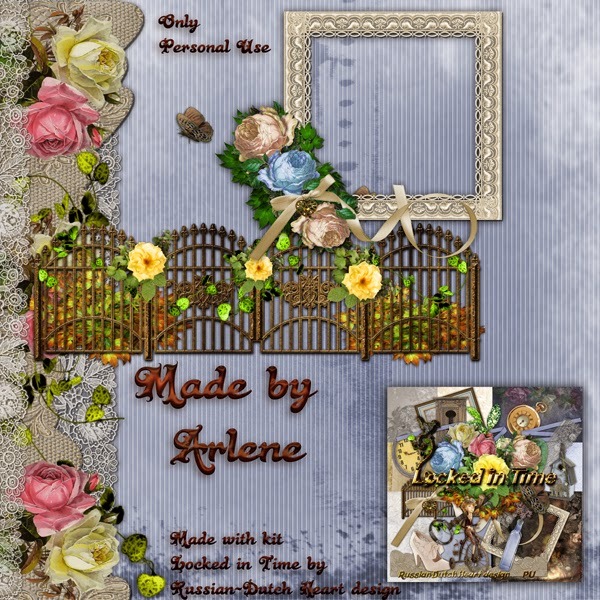 Arlene made you two fantastic page borders and a sweet frame too! I am going to open the garden doors now, to let in a bit of fresh air, sun is shining at the moment, so our cat is happy too. Every time I come into the garden he meows and is throwing himself on the ground on his back. I am supposed to great him then and caress and cuddle him a bit.LOL! You have a wonderful day with lots of sunshine! I will try to make it a "quick"post. It will be a bit cooler outside today, but if the sun will shine, I think it still will be nice weather to be outside, for sure if you can stay out of the wind. We had a bit of rain yesterday evening, it was much needed. After I've written this post, I will check in the garden(as Jan and I do EVERY day now) because every day there is something new to spot. Yesterday I did some housework, was pleased about myself, not much left to do today, hoorray, so perhaps we will go somewhere later, if the weather still holds on to be nice. There are several faires going on this weekend, so we will have choice enough. My friend Edna is working on a chrochet afghan, which is almost finished, and she wants to make another one. Now I am such a nerd, who hops into internet to see if I can find some not too complicated, but still nice patterns, and I did find some for her. The aweful thing about that "search"is that you always linger longer there, because you see so much wonderful things and get distracted so easily!. So I am rather late this morning with my post as a result. It's not too bad, cause i don;t have all too much news to ramble about. No picturesnyet, but I will try to make some of the afghan I am working on and some of the garden, this weekend. It;s about time I make photos of the progress there LOL. Also hope to start another kit this weekend, production of them is still a bit low, I will get there again, grin! May be I just skip a posting on Monday(we have two Easter days here), but I will see how it goes. So don;t be worried if I might not be there on Monday, I just take an extra day off, okay? 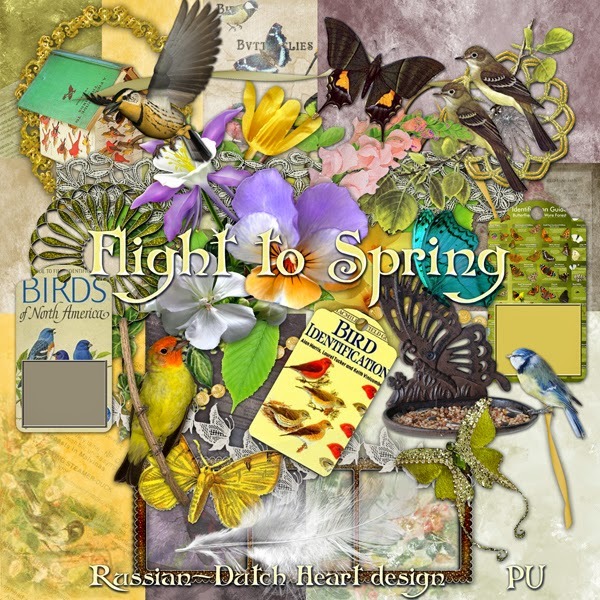 Today's kit might give you a real spring-feeling, as I named it "Flight to Spring". And what a beautiful work Arlene has done again, the clusters are simply gorgeous. Wishing you all a blessed and joyful Easter I leave you in peace now, hahaha. Monday I went to the hospital for the annual check at the neurologist. Oh my, again I was lucky. I didn;t have to wait very long to be called in and had a nice, but short chat with the doctor. Gosh, with all the new rules they came up in healthcare, now my neurologist can only give me a prescription for 6 months ahead! Normally she would writetwo, each with reherseal for it, and that would do for the whole year. It's annoying and now I will have to call her or my house doctor when I need medicin prescription again. No big deal, I know, but it was much easier the "old"way. As I was done there much sooner than I thought, I went to town centre for a moment. Jan wanted to have a new watering can for in the house, it seems the one we have is leaking a bit. So that was something I could take a look for, but didn;t came home with one. The ones I spotted, were just not nice of handy , yes, I was very picky LOL. I took my time a bit in town and was home around 16.30. Jan took a little trip to the market and came home with some fruit and a bunch of stewpears, and I made us a little pan yesterday and they tasted wonderful. Yesterday we both had a day of "doing nothing" . Well, we watched a bit TV, Jan did some puzzles, we took a look around the garden, but nothing more. It also wasn;t the bst weather to take a walk or so, temperatures had dropped and there was a very cold wind blowing. They warned on the weather forecast that it might even give some night frost, and that is bad news for the fruitgrowers! With that nice weather lately, lots of fruittrees already are in bloom, but a frost on it could have a disatrous effect on them, so everywhere in the country the growers had parrafine fires burning, so that the temperatures couldn;t drop too much. It might be that this night they will have to do the same, but then the weather should get better again, with much higher temperatures. I do hope so, for them but also for us, because this weekend there are a lot of little faires going on, and it will be nice to visit a couple walking in the sun with nice temps around 65 F! I also started again on the 4rth part of the throw over. The one I was busy with, didn;t look good to me, speaking pattern-wise. So i looked around a bit on internet to find me another pattern( I found a lot, picked out the ones I liked mst and printed them out)_and started again. And yes, the one I am doing right now, looks beautiful. With all that searching around for patterns, I am making a little folder, so I have all patterns together. Today not too much lingering around, I guess. Some shopping has to be done, I am using the last can of catfood, coffee is running out too and some more things. And it will be a good time to look around for something for dinner with Easter, perhaps today the supermarket will not be crowded yet, but I am sure on Friday it will be a different thing. It looks to be okay outside, perhaps not yet all too warm, but for now the sun is shining and not much wind, good conditions to go out. I must say we could do with a little rainshower, some of the planters would be very happy with it, as well as some parts of the garden. But it would be nice if the rain would come in the evening or night, just enough to soak the soil a bit and then it can go away LOL. That's it for now, so on to the freebie. 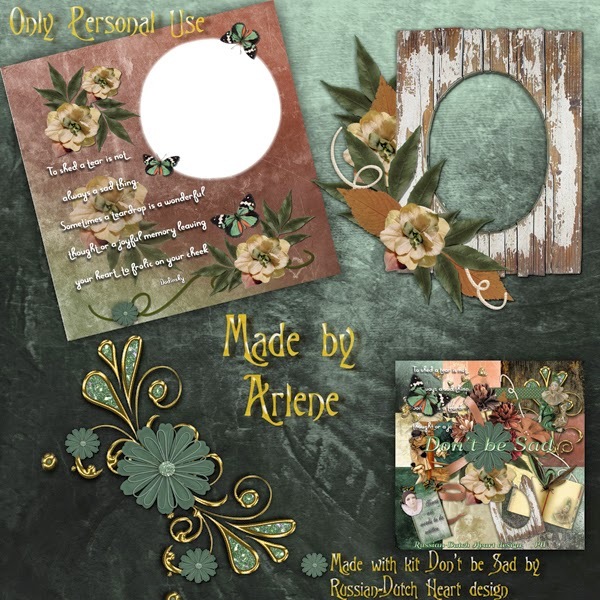 The kit is nemd "Ladie' s Elegancy"and you are really treated by Arlene, because she made two lovely page overlays and a sweet cluster. Have a wonderful day, see you again on Friday. Still no "Daddies"but good show ! Have to be a little quick today, cause later I will have to go to hospital for the annual chek at the neurologist for the epilepsie. No big deal, but it just takes time, not going there, only about 5 minutes with the tram, but you always have to wait some time there. Friday I was a good girl, I did all the ironing, yeah, and after that I also hit the house with the vacuum cleaner, and the dusting cloth, and was happy about myself. In the evening we watched our Everybody dance now show, not yet with the Daddies, we will have to wait a bit more, but the show had some great acts. I specially liked a very young couple that was dancing a latin ball room dance and they are good! I have links for you of the 3 editions they performed an act, and they reached the final! So I think it will be very hard to make a choice between several acts that will compete in the final. Saturday was a real nice day, with rather good weather, we still cannot complain about that! We even can use a bit of rain, the new sprouts would be greatful LOL! In the early afternoon I started in the kitchen to make us a potatoe sald, filled with dices of ham salami and bacon, together with cucumber and apple and a good dressing for the evening. It took me some time but I didn;t mind. That finished I sat down to do some knitting( this weekend I already started on the 4th part of the throw over) but then got a phonecall of Heidi, that she wanted to come for a quick visit. Hey, that was nice. She even tasted the salad and approved of it, so I gave her a little bowl with that. We did the "garden-round"of course, because she didn;t yet see all the work Jan has done there. We chatted about this and that and in the mean time Jan came home from a long walk, so Heidi could give her compliments to him for his work. Sunday we both spent some time in the garden, cause some of the seedlings desparately needed more room, and some of them were even big eneough to be planted out in the garden. Oh my, it was ever so nice to be busy there again for a while. Now we are just a bit impatient to see the whole lot flowering LOL. But that will need somoe more weeks till it happens. Time to finish the post now, if I want to be ready in time for the hospital visit. Have to wash my hair and model it a bit when drying with the hair dryer. 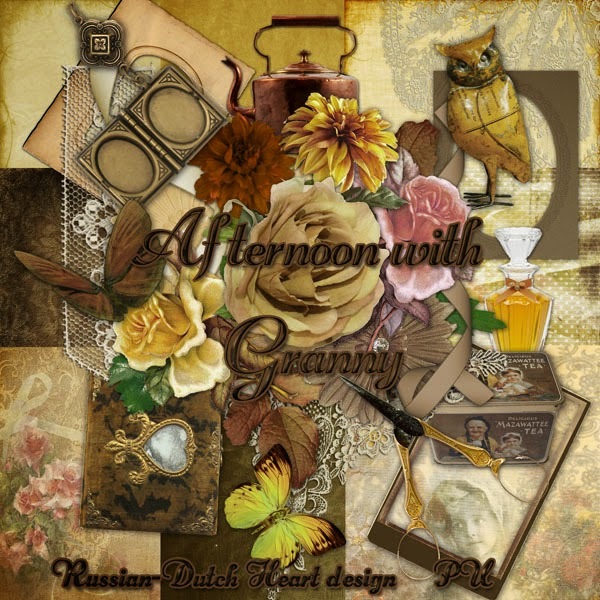 I have a kit for you named "Afternoon with Granny", with some lovely clusters from Arlene. Yes, the throw over I am busy with is surely progressing. I hope to finish the 3rd part of it today and can start with a new pattern. It will take some time to have it done and then assemble the pieces and if I have courage I will make a border too around it. But it keeps me busy and out of misschief LOL. Nothing much happened these last days, just went Wednesday afternoon to the hospital for the lung photo, and oh my God, I was lucky to be in and out of the hospital within about 15 minutes. As I was already halfway to town centre, I went on and went quickly to the Chinese shop for some noodle soups, looked around in a couple of shops, came home with 3 little solar lights for the garden(they were really for a bargain price). Yesterday was grocerie shopping day, that went quick too, and the rest of the day I was lazy(taking a nap in the afternoon). Sounds rather boring, isn;t it, but that is how usual life can be, and I don;t mind it from time to time. Weather is a bit less good, temperatures dropped some degrees, here and there a little rian falls, but we also see sunshine. And when you can sit out of the wind and in the sun it's not bad at all. Today I think I will spend inside, there is laundry waiting to be ironed, and the house can do with a vacuum clean, like to go into the weekend with a more or less clean house LOL. If I am right this time, this evening we will watch the final of Everybody dance now with our favourite group "The Daddies". Let's hope the show will be lots of fun. 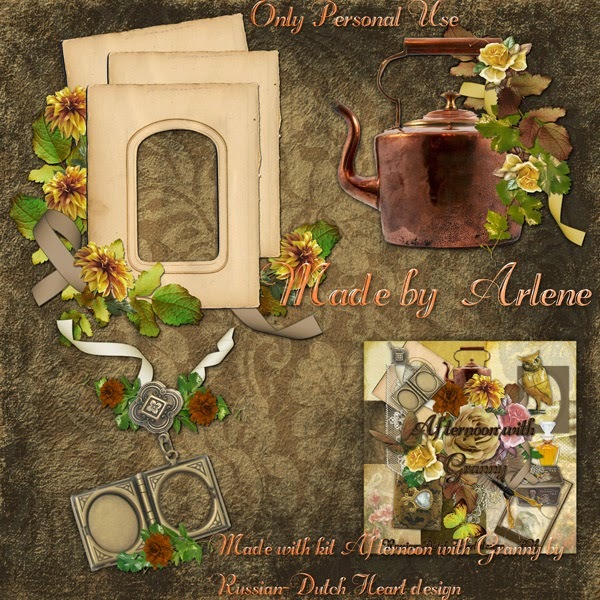 Better i quite rambling, as I do;t have anything more to tell, so here is your freebie, First I want to give you the link to Arlene's deviant art site, she has posted a few new frames and some great backgrounds. 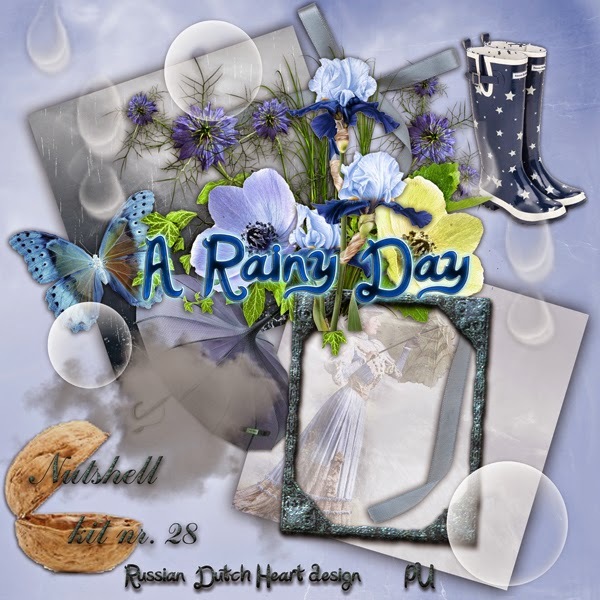 The kit today is another Nutshell kit, named A Rainy Day, hope you will like it, together with some clusters from Arlene. My hubbie surprised me, LOL! Time is slipping through my fingers again, can;t find enough time to do all things I want to in a day, and sometimes I just want to do too much and the energy is lacking a bit. Oh well, at our age we should get used to that LOL. Ghee, Monday the temperature had dropped several degrees at once, and there were some serious rainshowers. But yesterday it already looked a bit better, large part of the day it kept dry, and we had sunshine but this whole week temperatures will not reach to the ones we had the weeks before. Nevertheless some of that rain is welcomed by the garden, and after such a rainy day, you can see the sprouts of all the the bulbs and other plants make haste to get a bit higher and greener and such. This is, sad enough, just the kind of weather snails seem to love. So for the the next few weeks I;ll do the evening round, to keep them away as much as possible, because they adore the tiny new leaves of seeds coming up and some spring flowering plants, like violets. Yak. The frog family is hopping around again! Monday evening I suppose they all got out to go to a disco party or such, because when I was snailhunting, I saw about 5 of them and a toad too! One of the frogs even hopped into the kitchen, but was removed softly by Jan LOL. Oh yes, Jan surprised me yesterday. I had to go out to get some presdcription at the drugstore, and something for dinner that evening, and when I came back Jan was just finished with the long curtains at the garden door. He took them off and washed them and also cleaned the windows there. I was already thinking about that job(but to get from "thinking"to "doing"is a great step ROFL) and now this sweet guy of me did the job! Today I want to go to hospital to have the lungphoto taken, that is well in time before my appointment with the doctor there somewhere in May or June.Hopefully I will have not to wait too long there, there is no meed to make an appointment, you just can go with your doctor's paper, but sometimes it can be a kind of "rush hour". And yesterday Jan and I both a kind of little shock when the mail arrived. Suddenly we had 6 envelopes there. 3 for each of us, from the taxoffice.! We always get a kind of bouncing heart when we see taxoffice envelopes or council department envelopes in the mail. Often they only cost you money, but this time we were saved hahaha. They just asked us to check the data of our accountant andif we still had our same accountant we had to do nothing, then we still were giving him full consent to do his job. Had something to do with a request for the last 3 years done by the accountant, so they sent a letter about each year seprately. What a waiste of paper. But pfffffffff, we were glad it was just that! Today I have, as promised, the clusters from Arlene she made with the Don;t be Sad kit. I very much like the quickpage with the quote she made.By the way, you can pick p a beautiful quickpage, made with this kit too at Linda's blog! That will be all for today, the designing is going on a very slow pace these days, can;t seem to find enough time, and I don;t want to be at the computer in the evening( well, it happens sometimes, but it's not a "usual"thing).But Friday I have a kit for you again. Have a nice day, hope that who ever is longing for real spring time weather will not have to wait long anymore. It's about time, all snow and cold disappears and our bodies can take in some sunshine( with nice temperatures). I was ALL mixe up! Gosh, I was really mixing it up in the Friday post, concerning The Daddies! For one: the program is NOT So you think you can dance(we have that one too, but it's all different) but "Everybody Dance Now". And last Friday was the second half final of the show, so The Daddies were not there, cause they already got into the final, and that will be this week. !Confusing hey? But never the less it was a good show and some real good performances. What I did that Friday? Oh yes, I went to the market! Gosh, it's becoming a bit of a mess there, with the works going on there to (hoepfully) improve the market. Still it's nice to have a walk there and I came home with just a few things, but it was okay. I found some great French cheese, which was an offer for nice prive(one of it was a goatcheese, I love those, specially the "older"ones). Yummie, I also bought a french bread and we took that later in the evenings in the weekend. satuday you sould know where I went LOL! Yes, to that supermarket with the offer of gardenplants. Oh my, I had to control myself there, because they really had a lot of different ones but I came home with two rose bushes( okay, they are now just stems but I hope soon the leaves will come out), and imagine this, two roses for the price of € 1,50 ! !I don;t know if they will EVEr become real rose bushes, but for that price it's worth the try. And I also bought a little rhododenron (well, I think it's an azalea but sometimes the names are mixed up) and and abutilon( which is more a plant for a big planter, which I have surprisinly). Then also two seed sackets, with all prepared seed mats in it, so you have only to sread it out on the soil, make it wet enough an cover it with a thin layer of soil. And a package of seeds of beans, just for the fun to try. And some great slippers to use for the garden, I saw them standing, looked at the size, oh, just the right one for me, and then saw the price, was reduced and had to take them home LOL). Even bought there a few grocerie things and wnet home quickly. And the weather was soooo great, that Jan and I right away started planting all the new stuff( had to remove and re-plant some things to find room LOL, ) and after all was done, had a relax hour in the garden, in the sun. Yesterday the weather was cloudy and rainy, had to stay in, okay, I changed the bedsheets, to give myself the feeling I actually did something that was ncessary, hahaha, but the rest of the day we took it easy. But'''in the late evenings"when it is dark already, I go again snail-hunting"Yeah, they are starting to come now and I just have to do the most to protect all the new plants that start to grow. Sorry for the snails, but we love our plants, so some of those creatures just have to disappear. And already saw some of the froggs again. So that's it more or less, now have to linger not too long at the computer, because today I will go to the doggies again. Don;t know if Heidi will be home when I return of the doggie walk, but if she is, I will tell her all about the plants I bought LOL. Today I only have a kit for you, the clusters(which are a treat) from Arlene will be ready for you on Wednesday, because I received them but don;t have time anymore to make the preview and upload them. 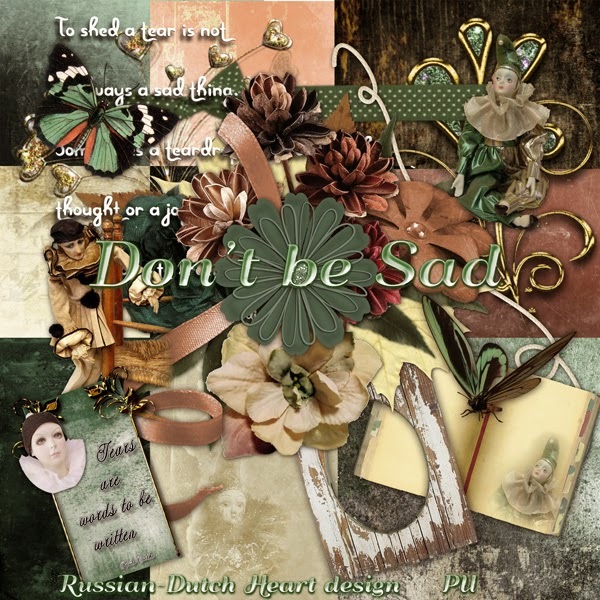 So today just the kit"Don't be Sad"and on Wednesday the clusters. Is that an okay-deal? We enjoyed some really nice days here, weather behaved real great! Wednesday I did part of my shopping, and was back home quite quickly. That also because may be Heidi would come by. But later the phone rang and I knew that was her and I was right. She felt sorry, but told me she didn;t come, her foot gave her still too much problems(she was out already in the morning for fysio and later the dentist) so I could understand her. Okay, suddenly there was time left. I used that well, and did a vacuum cleaning all over the house, even some dusting and some other little jobs and even did some designing at the computer. Next day I was up early again, so I finaly finished the kit I was working on, and later went out to do the last shopping things. Home again, hang out the laundry that was ready, and finished the second part of the throw over, yeah! Then my eyelids became soooooo heavy, that I took a nap. How wonderful that was LOL. It's a bit pity of the time, I know, but sometimes I just seem to need it. Today I don;t know yet for sure what we will be doing. Probably Jan and I will go to the market, while it still is nice weather, I can use a bit of veggies and our cheese is almost finished, so good excuse to go there. Somewhere this weekend I also need to do a bit of ironing, but today I'll try to enjoy the weather. Suddenly everywhere in our planters and in the garden itself bulbs and seeds are doing their best to peep out of the soil and oh my, how quick that is going at times! Then this evening we have to watch The Daddies again, of course! I really hope they will come with a great act again. I guess they never expected to be such a success! And this week we had some folders in the post(all advertisement, you know) and I always like to look them throug a bit. But it can be dangerous too! One of the shops was advertising some gardenplants for a really very low price and the sell will start tomorrow! I am not sure if they will be of the best quality, but for the price of €1,50 for a plant you always can try it out. They have roses, cleamtis and some others, so where do you think Kyra is going tomorrow?????????????? And while I am there(it's the supermarket I go to once in while with the tram) I can take some stuff to fill up our "stock"
At the moment it looks a bit grey outside, I do hope later on the sun will come out again, all is looking so much nicer. And now the freebie. 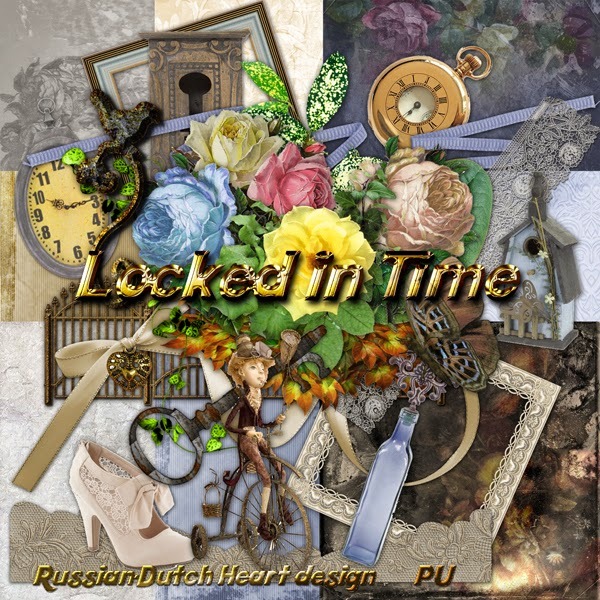 I have one named "Locked in Time " a bit nostalgic, but to use for all kind of layouts. 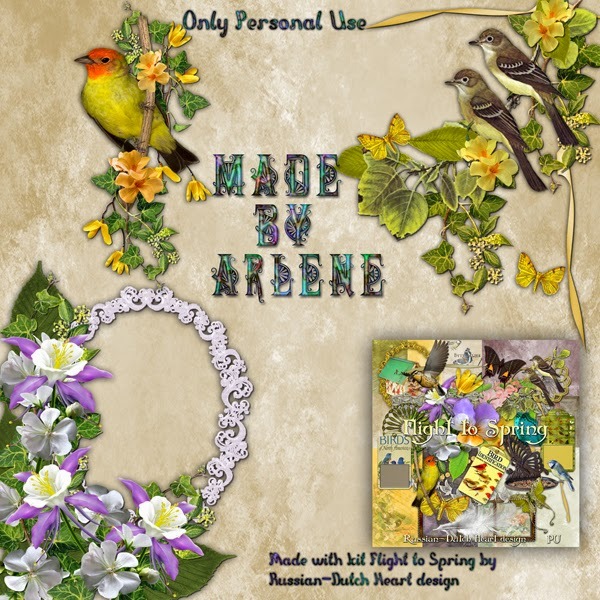 And Arlene did some wonderful things too, I love the page border she has made! Have a fantastic weekend and thanks for your visit! Curious about my post title?? I will explain a bit later. So Monday I did a bit of gardening, and dug out a rose bush I promised Heidi. Oh my, that is hard work!! I could just finish it and then really had to sit down for a couple of minutes, to get my breath back again. I packed it well, the bush, so it couldn;t dry out and was happy I did the job. Now we have a little bit of a free space again, for a new plant or little bush, grin! Next day I was up early, but after a good night sleep, so I was happy and had all the time of the world before I had to go to Heidi. I went there real early afternoon, I knew she wouldn;t be home yet, so I went there with my rose and first took the dogs for the walk. They were all happy to see me and we had a nice walk, and the younger one Tom, had plenty of playing time with a tennisball, we found on the dogs playground. Back again Heidi ws home so we first had a chat with a cup of coffee and then I planted the bush for her. In return, I got a few cutlings from plants that mysteriously had disappeared in my garden( blaim mostly Jan for it LOL), and went home after a while. If she feels okay enough with her foot, Heidi might come to us, to have a look at Jan;s garden work. But first I will have to go out for the shopping, so today I don;t have all the time of the world. Now about the blogpost title. We watch the show/competition So you think you can dance now on Friday evenings. And there are some real good acts, but one is favourite of me and I think of whole Holland! About 3 weeks ago there was a group of children with a very good dance act. But most funny was, that the dads of the children talked with eachother and thought they might performe too, just for fun! They have about no dance experience at all, but wht a great show they gave! If you talk "entertainement"that was IT! And they went through to the next round. And to the next round too, so if I am right they will dance in the final this Friday! I assembled some videos for you from you tube(well, I have the links) of their acts and you really should take a look, I think they are just fantastic and will bring a big smile onto your faces. Start with the first one, you should do so, cause you can see the progress of the passed weeks! I cannot wait to see what they will come up with this Friday! Now time for me to say goodbye to you (only for today, don;t worry), have to do some things before Heidi might come for a visit. Oh, please go to Linda's blog, she has another splendid quickpage for you! Two such great clusters from Arlene too! Have a fantastic day and hope you will have a smile on your face, after seeing those video's!